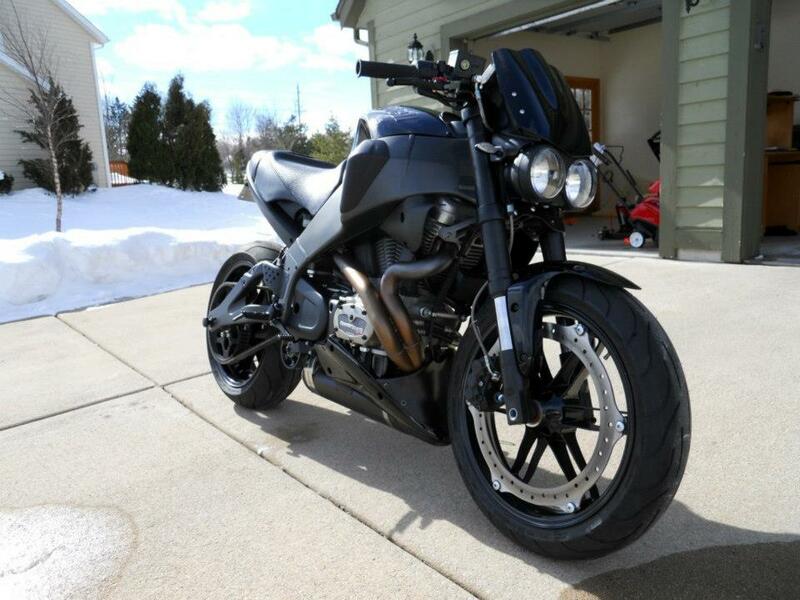 Was wondering if anybody can recommend a good shop to anodize buell parts. I am in California but can ship my parts. Could you give us an idea of what your trying to accomplish with the anodize? Are you looking for color, is so which color? Finish to match other items on the bike? Are looking for a dielectric coating / corrosion protection? thanks for the reply... Not sure what the difference is. Am not looking to match any color. I have two (2) sets of rims and am wanting to anodize one set dark blue and the other set black. Also am going to anodize an after market tail section and XBS seat rails black. Also the front forks and triple clamps. I'm not 100% you can do cast aluminum(seat rails possibly the rims), powder coat your fine though...I know there's a place we deal with in Upstate NY for out business(we make locomotive wheel machine tools) but I'm sure you'll find something much closer/cheaper to ship to. Powder is cheaper and more durable. Go that route. Heres a members bike we blacked out. That looks great.... 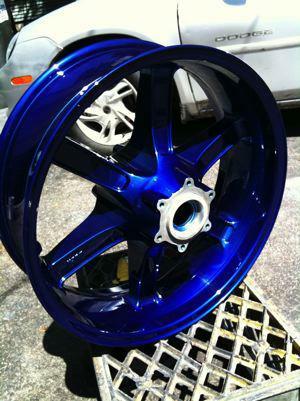 I was hoping to do one set of wheels in blue and I do not think the blue would look good powder coated. The black powder coated looks great. The stock rims are anodized and I was hoping a person could anodize the rims in a dark blue. That is an excellent shade of blue. What is the name of that shade. 2 coats of Trans Blue over terminal chrome. All powder. The things that can be done with powder these days is amazing, look into it. Specialized Coatings in Huntington Beach Ca. did an excellent job powder coating hubs and rims for my cruiser. And remember, "anodized" coatings will fade with sun exposure, and not evenly. Power coating is more like paint and will hold the color a LOT longer. I'd advise against anodizing cast parts, from my own personal experience. Billet parts are GREAT anodized, but cast parts are better powdercoated. Thanks for everbody's input..its much appreciated. The stock rims are powder coated. If you anodize the rims they would look horrible because of the cast surfaces. You would not have a very consistent looking color/surface. Some surfaces are machined and some are as cast. Powder is definitely the way to go. Fantastic, I thought the rims were anodized. I am glad you clarified this. I will be looking at powder coating. I just want it to have a little gloss and not be a flat color. We use Pacific Coast a LOT - motorcycle wheels and we even had them powdercoat 4 steel patio chairs and a table for outside use. Looks so good that we gave away our ratty dining room table and use the PATIO TABLE and chairs as a 4-seat dining room table. They are located here in Palmdale and I can highly recommend them.